1. We are licensed, bonded and insured. We are a legitimate FULL-TIME BUSINESS and want to protect your assets if a customer gets injured on your property during the sale. Also, all Antiques & Estate Sellers employees are bonded to protect your assets and funds. Most of our competitors do not carry all three! 2. Our commission rate starts as low as 25%. 3. 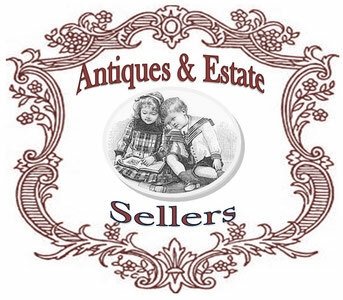 We feel our knowledge exceeds our competition with antiques and collectibles because this is our specialty. 4. Our competitors usually conduct a 2 to 3 day sale, because it's more about quantity verses quality. However, Antiques & Estate Sellers is all about QUALITY. The least amount of days we run an estate sale is 3 to 5 days and we have anywhere from 700 to 1100 customers, which equals more money for you. We are willing to work more days and longer hours to bring you the most amount of money possible and we don't charge extra for it! Usually Antiques & Estate Sellers will have approximately 60 to 80 people lined up at the door on the morning of the first day of an estate sale (recently we had an estate sale with over 200 people within the first 90 minutes!). We have such a huge following of customers from our subscriber email list, print advertising and the 13 websites we use for advertising your estate sale. 5. Our low commission includes the $300 to $400 of print and online advertising, which does not come out of your portion of the profits! 6. We use security cameras on all of our estate sales to protect your valuables. We provide only one way in the home and one way out. All small items of value are secured in locked display cases or placed by the cashier. The cameras do not scare honest customers away! Also, our honest staff is very comfortable under video surveillance and we bond all of our staff to provide peace of mind to our clients. 7. At the end of the sale you will receive a copy of the gross sales total from our actual cash register. All sales go through our cash register! We will give you a copy and keep a copy for reporting to the IRS (Internal Revenue Service). 8. 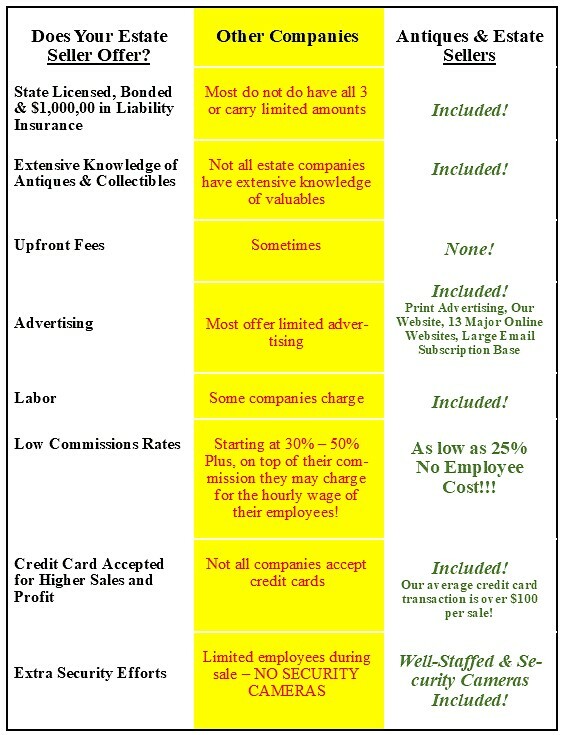 NO UPFRONT FEES! ALWAYS FREE CONSULTATION!